STARRING Geraldine O'Rawe, Christien Anholt, Stephen McGann and John Kavanagh. SYNOPSIS Ferdinand Rupitsch, a bookseller who dreams of becoming a writer, lives on a remote island in the Baltic Sea. 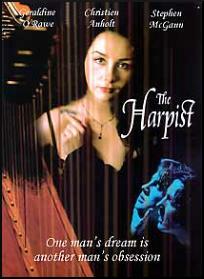 Ferdinand's life is about to change as he encounters the beautiful and talented harpist, Rebecca. Driven to know her better, Ferdinand takes advice from a mysterious stranger, named Henry. As Rebecca sets of for Hamburg, she is unaware that she is being followed. Ferdinand takes a place nearby and slowly moves into Rebecca's life. As things between the two heat up, Henry becomes dangerously jealous. Ferdinand's trusted teacher and friend soon becomes an enemy. The couple find they cannot hide from the obsessive Henry, but Rebecca may not be as much in the dark about about their pursuer as Ferdinand thinks she is.